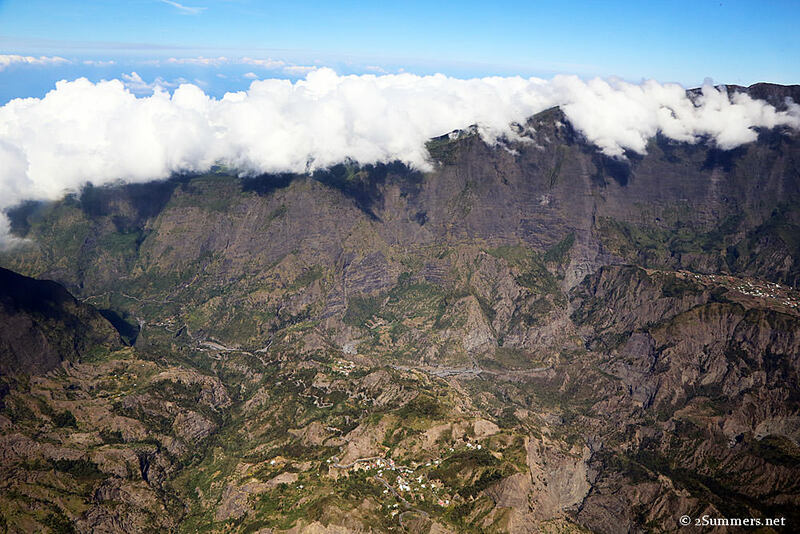 I’ve just returned from a weeklong trip to Reunion Island with six other blogger/writer/photographers, as part of a camapign called #GoToReunion. We experienced so many amazing things during those seven days; by the end of the week I was already struggling to remember what we’d done at the beginning. Yesterday I began the long, slow process of sifting through my pictures from Reunion, trying to wrangle them into some kind of order so I can edit them and put them into my blog. 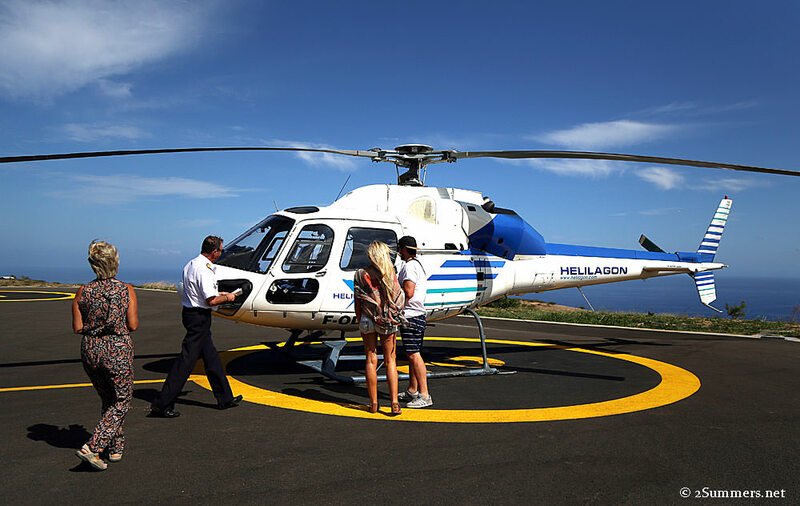 I started with our first major activity — a 40-minute helicopter tour of the island with Helilagon. As I scrolled through the pictures, the memory of that experience returned, and my jaw slowly dropped. If not for these photos I might have convinced myself that the Reunion helicopter ride was a dream. It was that surreal. I haven’t yet sifted beyond my photos of the helicopter ride. I need to blog about it before the memory fades. Did I actually fly over a lava-spewing volcano on a tiny island in the middle of the Indian Ocean? Well yes, it appears I did. I’ve been lucky enough to ride in a few helicopters in recent years (see here and here), even as recently as last month during the national Instameet. I confess that I’d become a bit blasé about it. Another exotic trip, another helicopter ride. Ho hum. 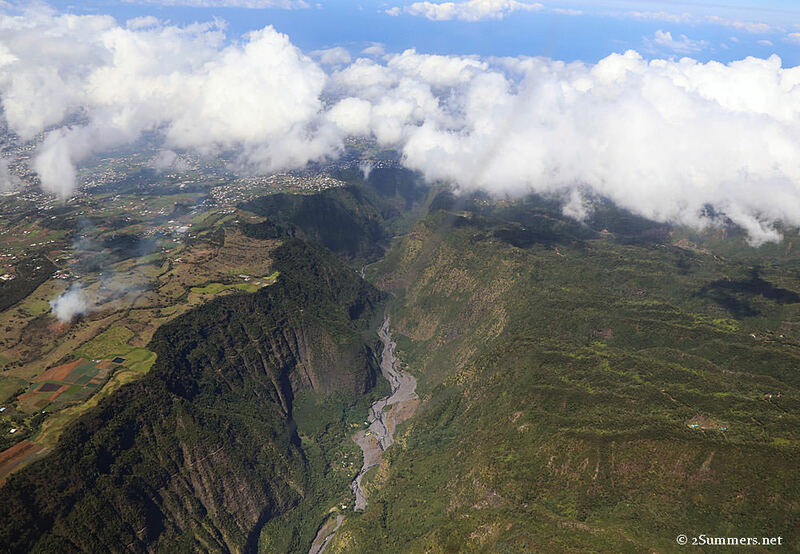 However, nothing could have prepared me for the Reunion Island helicopter ride. My previous helicopter trips were like tricycle rides in comparison. My friends Carlinn and Mike (right), getting ready to board the chopper. Like me, they had no idea what they were in for. The ride started out as I expected — we took off and skirted the ocean, with pretty views of the island’s western beaches and coastal towns. This was nice. But then we turned eastward, toward the island’s interior. The helicopter began to climb. 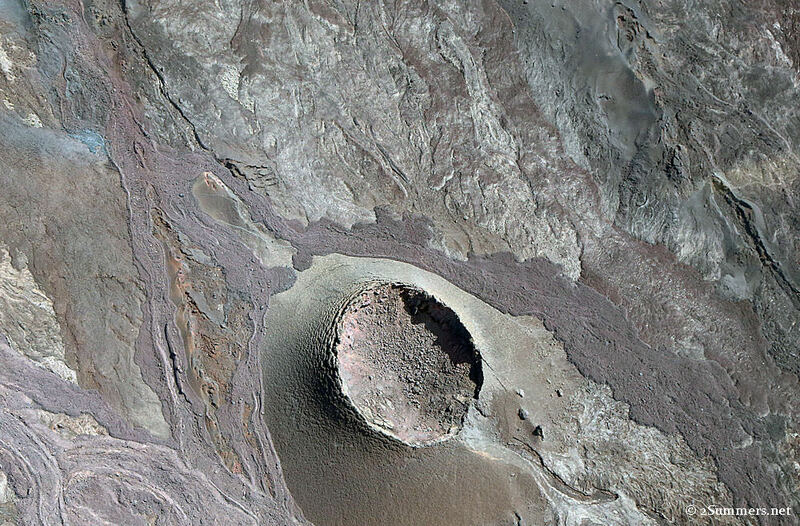 Did I mention that Reunion formed over a volcanic hotspot? The island is basically a big pile of volcanic rock bubbling above the surface of the ocean. 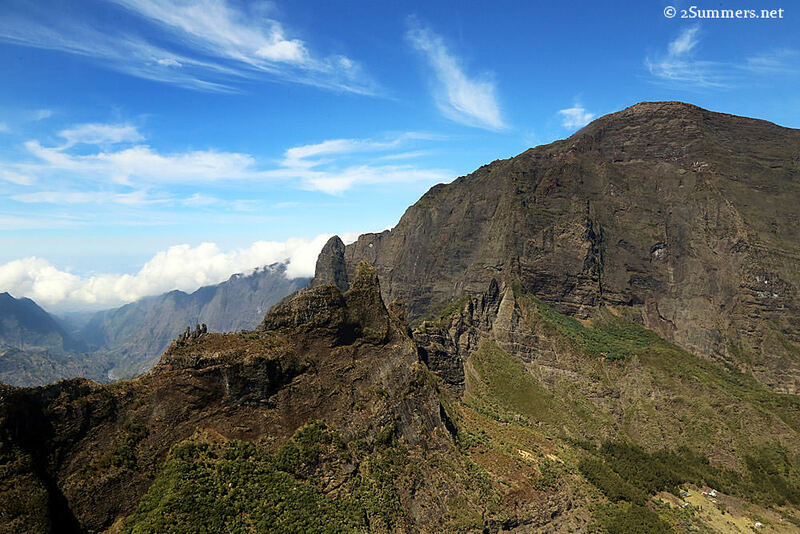 The tallest peak on the island, Piton des Nieges, is a dormant volcano more than 3000 meters (9842 feet) tall. Piton des Neiges is surrounded by three massive calderas, or cirques — giant, lush-green craters surrounded by soaring waterfalls and dotted with quaint villages accessible only by foot. On the other side of the island is Piton de la Fournaise, an active volcano that has erupted more than 100 times in the last 400 years. 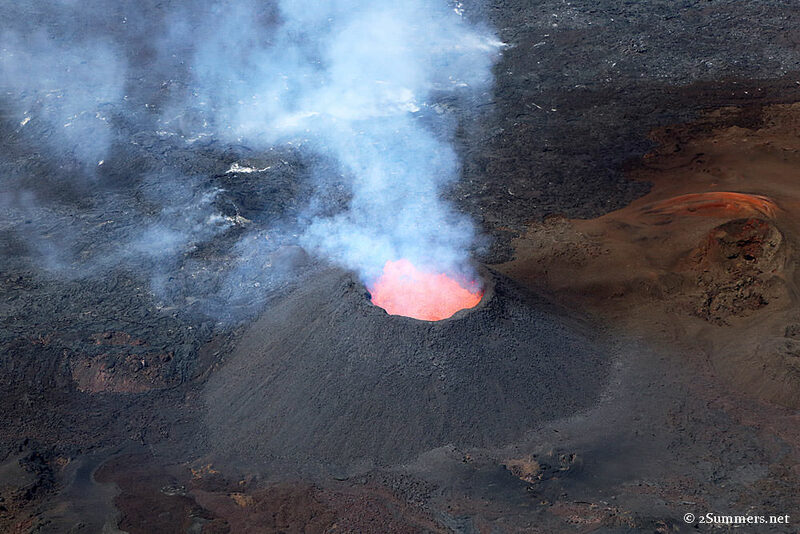 Piton de la Fournaise has been erupting on and off this whole year. It was in rare form during our visit last week. I’m doing my best to describe Reunion’s geography, but I’m no geographer and it’s a useless endeavor anyway. People had told me all of this before, too, but I didn’t get it until that helicopter crested the edge of the cirque. Below there was nothing but green. Above was nothing but blue. Ahead was a rocky precipice, and beyond that, white clouds. The pilot was speaking into my head phones but I couldn’t understand a word — his French accent was strong and the background noise was loud. The copter’s engine revved. Then we made a little hop, my stomach lurched, and we dropped over the precipice into the Cirque de Mafat. Everyone in the helicopter screamed, literally, with delight. My photos serve no justice at all. Half the time I was too excited to take pictures and I struggled with reflections on the windows. But I’ll show you what I’ve got. This wasn’t the actual moment when we went over the precipice into the first cirque. But I think the photo communicates what that moment felt like. 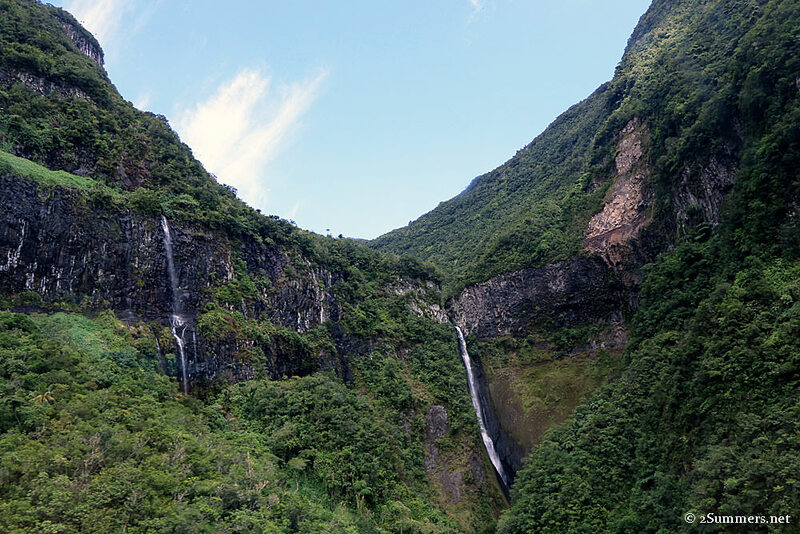 Emerald green mountainsides, cliffs, magical waterfalls…the usual. 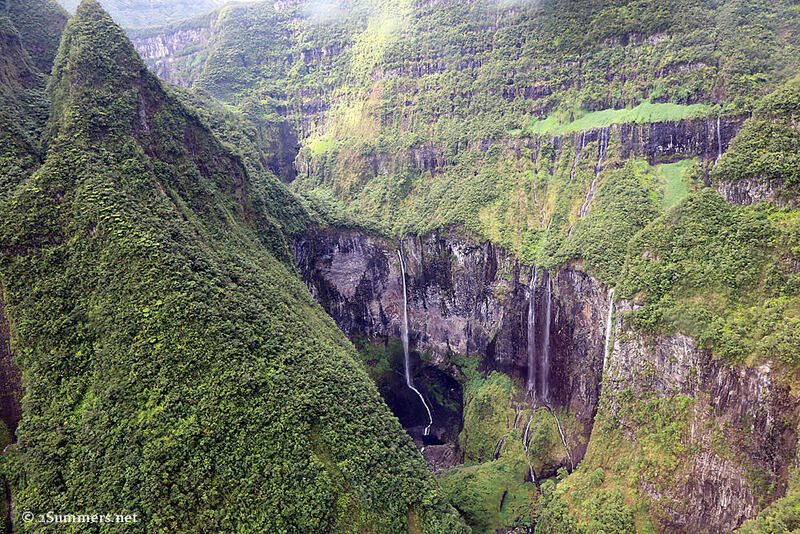 A cliffside covered in waterfalls. I mean really, what the actual f*ck? I think I was screaming again at this point, in disbelief. This canyon, pictured here and in the photo above, is called the Trou de Fer, or Iron Hole. 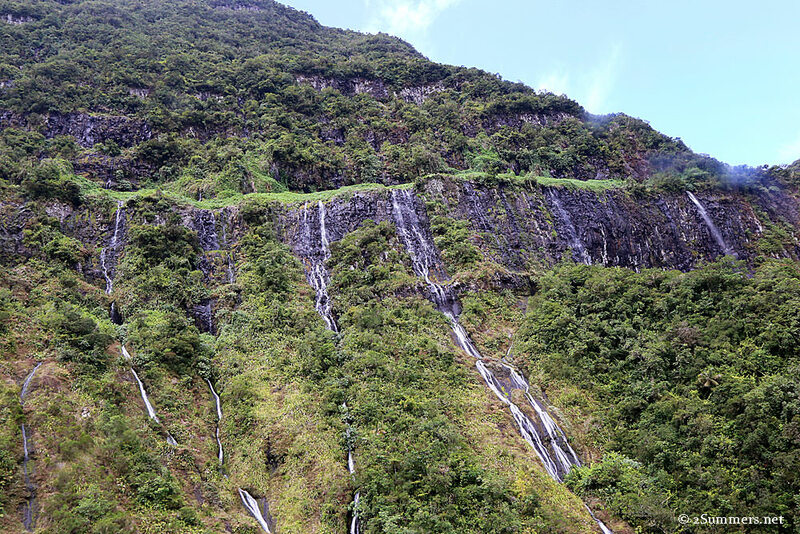 There are six waterfalls dumping water about 200 meters (600 feet) down. We took several flips through this canyon so everyone got a good view. I’m not sure where we were when I took this. Then we flew across the island to the active volcano. No, this is not the moon. It’s Reunion. I could barely breathe after the volcano. But there was more magnificence to come. I think this is the same river valley that we walked through a few days later. Tiny villages in the Cirque de Salazie. Look closely at the insanely curvy roads. Those roads made me car sick later in the week. Blue and green for days. Finally, back to the western coast. Check out that turquoise coral reef. 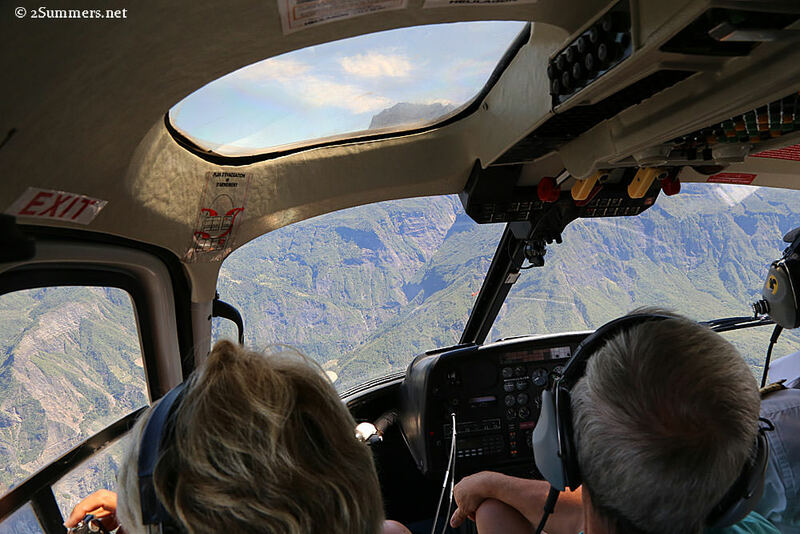 The Reunion Island helicopter ride ranks firmly in the top five most incredible experiences of my life, hands down. 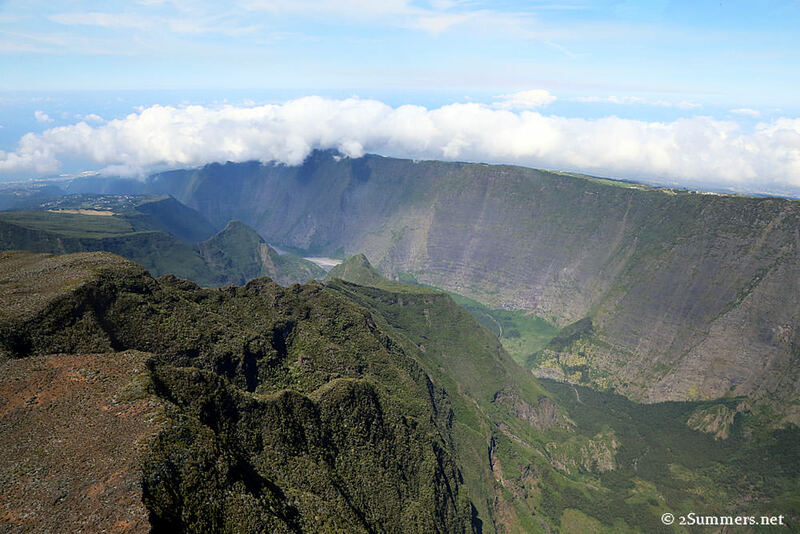 But this is only the beginning of my #GoToReunion story. Wait for it. 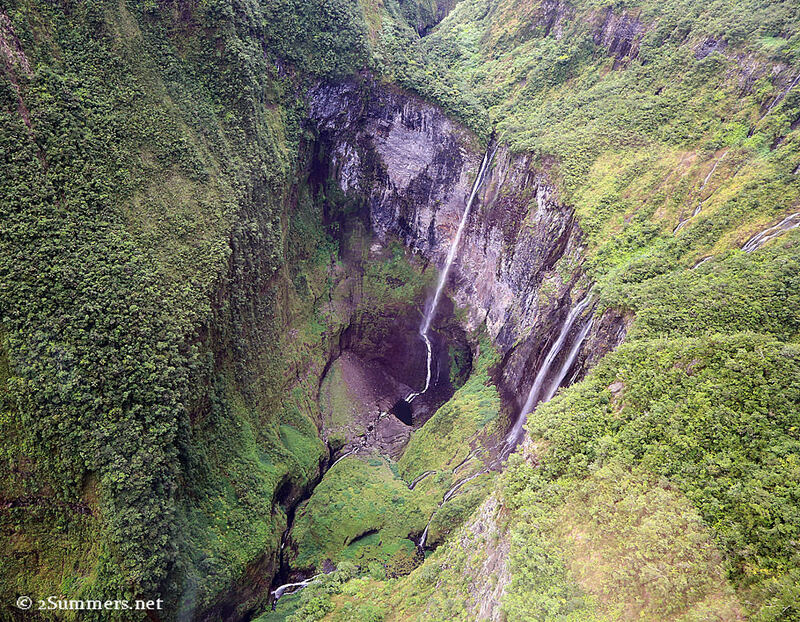 My trip to Reunion Island was courtesy of Reunion Island Tourism and Destinate. Opinions expressed are my own. Wow Heather. Who even are you? Andy Carrie ? These pics are incredible. Can’t wait for the next post. Amazing – you sure are having such awesome experiences. Where’s my like button gone? And my WordPress login? 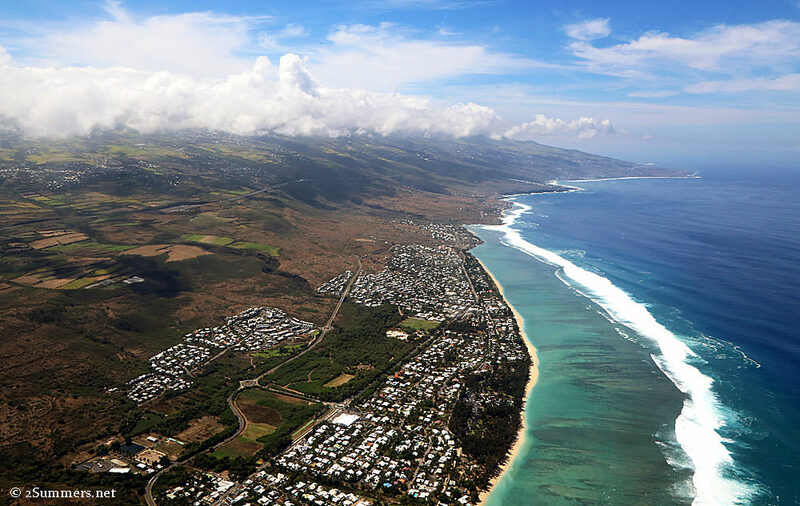 I’ve known about La Reunion forever simply because it is an overseas territory of France. I’d always heard it was France’s version of Hawaii and judging from your amazing pictures, it seems to be the truth! Reminds me so much of the spectacular vistas you’d see during episodes of Lost (which was filmed in Hawaii). Someday maybe I’ll go. Maybe I’ll go live there! I can after all, I have French citizenship. I’ve never been to Hawaii but yes, I think there are a lot of similarities. It’s a truly amazing place. Wow Heather! Seeing your amazing pics makes me want to go back to Reunion! So sad we didn’t get to see the volcano erupting! Just another reason to go back and experience more of this special island! Yeah, we were so lucky! I heard that you guys had a heli ride but not the same one. Either way, what a beautiful place. 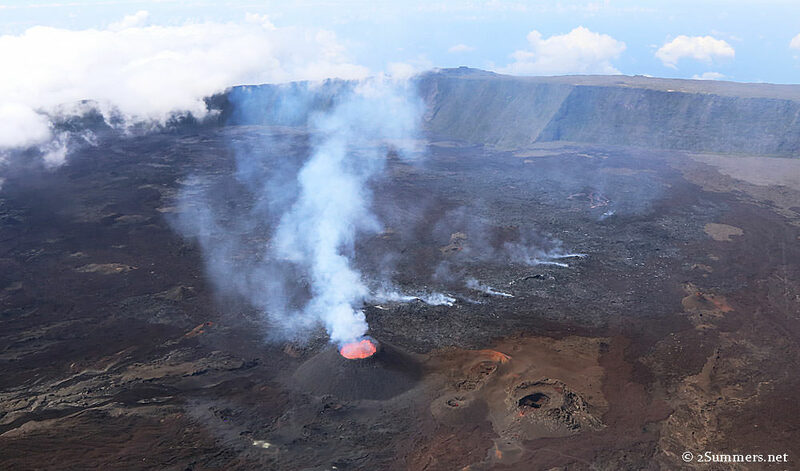 wow…I have heard a lot about reunion land…reading a first hand account of the volcano trip here. Also, to trek on the ground and then also see the path from the top is something not everybody gets a chance to do. Lucky! Incredible. I feel like there are still dinosaurs living down there somewhere in among all those canyons! Those are amazing! I’m impressed you managed any pictures at all. Thanks so much for sharing. Who knew such a place existed on earth outside of H. Rider Haggard!